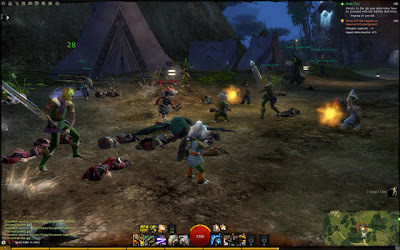 Guild wars 2 is an Mass multiplayer game that is set 250 years after the Guild Wars Eye of the North expansion. Guild Wars 2 is an exciting and fun active game with endless missions and tasks to complete set in Tyria the world is always changing and shape the world around by the choices you make. Features in Guild Wars 2 are forever changing because update and patches in the game happen regularly, this makes its a prominent feature in this game that there are always add on. The vast servers to choose from with European and US to choose and includes individual countries. You also have eight different character types to choose from and 5 different races to pick male and female. Endless amount of weapon choices with different skills to improve your character, the characters have an option to put different weapons together giving them different combinations. For example my character is an elementalist, the weapons that can be used are. The highest level you can reach is level 80, different weapon and armor rarity exotic being the highest for armor and legendary for weapons. Staff — Can cast different area effect spells with direct or lasting effects. Scepter — Casts various single and multiple target, medium range spells. Dagger — Emphasizes close range, heavy damage spells. Dagger — provides powerful close range abilities suitable for offense as well as abilities designed for defense. Focus — Provides supportive spells in form of energy shields, disabling snares and defensive area effects. The other main feature being the online mass multiplayer is the option to play different game modes. Is where players can sell and buy items and equipment they have find throughout the world, the profit you make will be saved within the trade post can be accessed anytime through an vendor. Where you team up as a group of five players and battle it out, with a game type like capture and hold. Which is an always fun experience but it does take some time to get used to, it made me annoyed and frustrated when I first started but give it time you will get used to it. This game mode will give you four different worlds to choose from depending on what server you play on. The options would include protecting and fighting in your server world, and the other two options being the enemies, also a free for all being the strongest server would control that map. The way WvW works is that its point based system where you will have to capture towers and keeps and supply deposits which counts towards overall score. This game mode can be difficult if your server you have joined isn't very committed to WvW or just short on numbers. This game mode can be very fun with the right amount of players and good commander to follow around. This feature in the game can be very useful if you find a good group or clan to join. Guilds can consist of many members from 1-50 and so on. The larger the guild more options you have to play with someone. This also isn't the main benefit of a guild it allows you to participate in Bounty and weekly rushes, such as puzzle and many more options and to choose and use. You also have Guild bank and treasure trove for higher ranking members. The guild will consist of six ranks, Squire, Knight, Officer, Templar, Baron and the leader, each rank giving you benefits and permissions within that Guild. Guild Wars 2 has beautiful graphics and setting if you have the computer power to run it on high. Personally me at first I did struggle because there are so many options to pick and choose and from and you will be a bit lost at first if you’re a newcomer like me. But after first week I got used to the game and how it worked and then I started to enjoy the game and find it fun and interesting along with the story mode learning many things as I went along. I would recommend purchasing a gaming mouse this will improve game a lot and make fighting and control of your character easier. The game manual does explain the basic keys to activate parts of the menu. 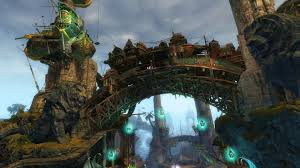 The gameplay within Guild wars 2 will always change depending on what zone of the map you enter different parts of the world are harder and more difficulty to survival, because of the different level zones. The story mode will always be different depending on what race you pick each one has its own story and path they follow, the story mode is very strong in depth and interesting with having different characters support you throughout the story mode. But never the less you will meet interesting characters and choices to help some you come across within Tyria with them giving you money for your services and mini tasks within each map you enter. As you can see by the picture you have thousands of places to discover roam and to make and continue your story. · Long lasting with and interesting and colorful world. · Many choices or races and characters. · Regular patches and updates to the game. · Weapons choices and combinations. · Sometimes can be overwhelming. · Time consuming to make a legendary item. · Not enough smaller missions to keep you busy. This game will give you mix of everything and so much detail you would get bored if I included all of it, this game is very additive and fun. Getting your character to level 80 will seem faraway and hard but it’s worth it. Overall to me the game is worth buying endless hours of fun and missions with many dungeons and objectives. If you’re looking for a game to have fun and enjoy and meet new people this is the game for you.